My grand dad was born before 1900. He worked for the SP Railroad his entire life and, like most railroad men, enjoyed the insides of a saloon on occasion. One of his expressions that as a kid I recall him saying was "about two bits worth". When asked what that meant, he went on to explain that two bits was a quarter, and one bit was 12 1/2 cents. One bit would get you a drink of decent whiskey in most saloons during the teens. In fact, a lot of saloon tokens have "Good for 12 1/2 cents" stamped on the reverse. Back then, most shots of whiskey were served in thin walled shot glasses; many etched with the brand name of the stuff you were drinkin'. They are what we've come to know as pre-pro shots. 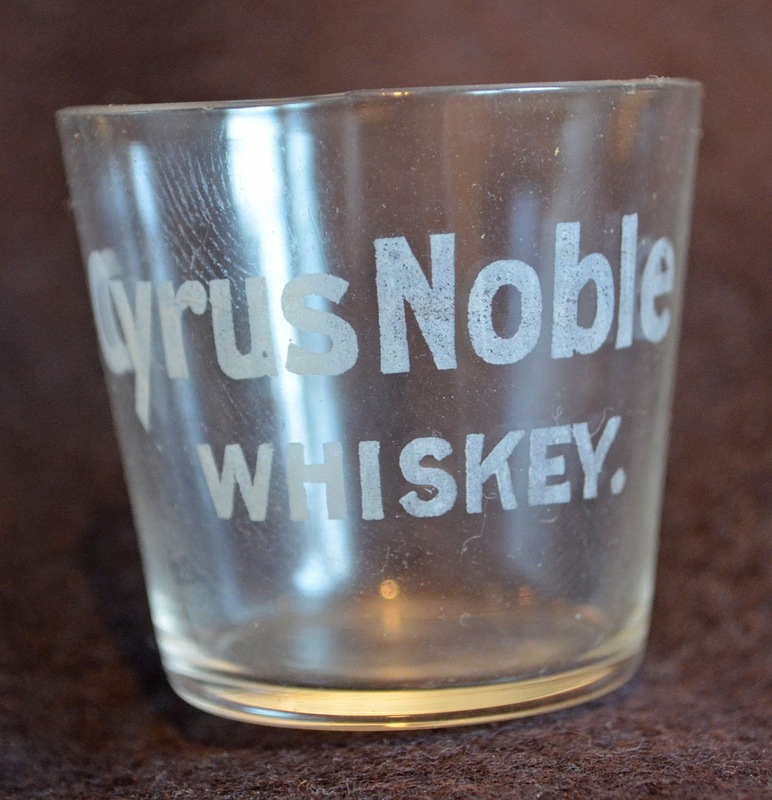 It is etched, "Cyrus Noble / Whiskey". I jokingly called it "Mini Me", as it was half the size of the standard glass, the base is notably smaller in diameter, and it measured only 1 1/2" tall. And before someone calls fowl, no - it's not a ground down standard glass. The etching pattern is correct in proportions and placement, and there are tooling lines in the lip. Simply, it was made that way. The Cyrus Noble brand really took off after the 1906 Earthquake and Fire, when Crown Distilleries began to push the brand hard in order to grab market share while most of their competitors were flat on their backs trying to avoid bankruptcy. 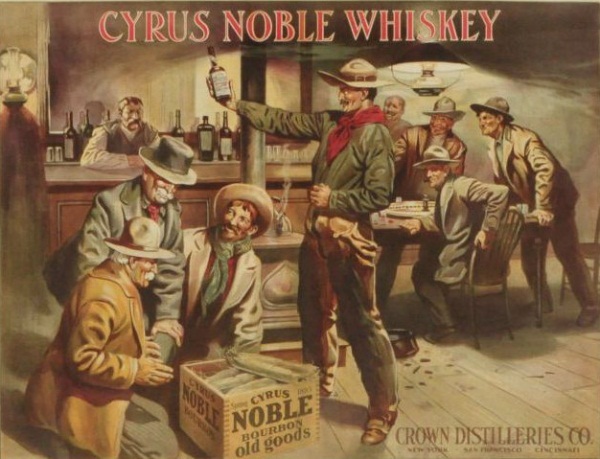 Cyrus Noble was good, reasonably priced whiskey; distilled, blended and rectified in San Francisco. It was sold in hogsheads to saloons with the brand burned into the barrel end, embossed fifths with a label and neck foil identifying the product, labeled only slick fifths, as well as embossed miniatures. The embossed minis were sold on the SP lines passenger trains, much like the airline cocktail single serving bottles of the 21st century. Back in the late 1960's, my grand dad and I pawed through a railroad siding dump in the Santa Cruz mountains where his section gang bunk cars had been parked during a winter in the late teens. There had been a saloon near the depot and amongst the broken Jesse Moore's, J.F. 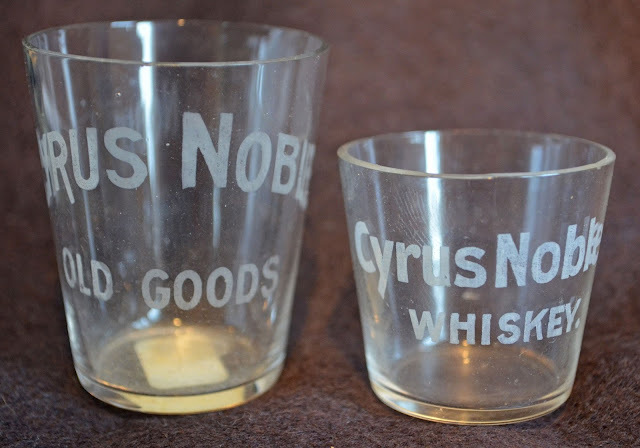 Cutters, and others, were Crown Distilleries fifths with lead neck foil identifying their previous contents as Cyrus Noble. He found it amusing that we were digging through piles of garbage that he had, no doubt, been partially responsible for creating; albeit fifty years prior. One can't help but wonder - maybe a half bits worth of whiskey (in the "Mini Me" glass) would loosen a man up enough to spring for a "bit" more. Great post on the Cyrus Noble mini shot. The story of your Gramps and you digging thru an old dump that he helped create hit home with me. My favorite collectibles were found here in the gold country from long gone camps and towns. They might not be rare or valuable to the "advanced" collector but for me they have the personal connection to our gold rush past.